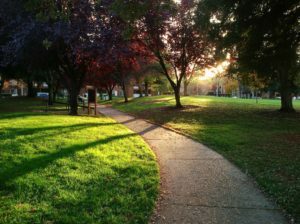 We may be part of Silicon Valley, but that far from defines the whole picture of beautiful Sunnyvale, California. With its Mediterranean climate, beautiful parks and recreation facilities, and friendly neighborhoods, it’s the perfect place for seniors to call home. And Visiting Angels is on hand to ensure that older adults can remain active and thriving with the help of our professional Sunnyvale home care services. By offering friendly, safe, reliable accompaniment and transportation assistance, Sunnyvale seniors who no longer drive are still able to get out and about, whenever and wherever suits them. Just a few of the fun destinations our area’s older adults enjoy visiting include the Lace Museum, the Heritage Park Museum, a leisurely stroll and picnic lunch at Baylands Park, or taking in a live show at the California Theatre Center. We can also assist with visiting friends and family, or simply taking a walk to the local coffee shop together – whatever sparks a senior’s interest. We realize there’s an overwhelming number of options available to care for senior loved ones, which is why Visiting Angels is committed to providing the resources you need to help determine what’s best in your particular situation. Our goal is to provide the perfect senior – caregiver match that will result in a lasting bond unlike any other. We’re also certified by CAHSAH (the California Association for Health Services at Home), ensuring that we meet rigorous standards in care. And we go above and beyond the norm in our in-depth orientation, ongoing training and more, so you can rest assured that your loved one is in the very best of hands at all times. We believe that home care in Sunnyvale, CA is the right choice in most situations, allowing seniors to age in place where they’re most comfortable, and we go to great lengths to ensure families’ peace of mind by thoroughly background checking and interviewing each of our caregivers, and ensure that they’re fully trained, experienced, and in many cases, certified. They also must possess intangible qualities such as compassion, patience, and a true passion for helping the elderly live fuller lives. We would never hire anyone we would not feel comfortable caring for our own senior loved ones, and if there’s ever a situation where a senior would prefer to switch to a different caregiver, we take care of that immediately – no questions asked. If you have further questions about our professional home care for Sunnyvale, CA seniors, please reach out to us any time at 408-735-0977. We look forward to the opportunity to help improve the quality of life and wellbeing for your senior loved ones!